‘When Ease of Use Matters Most’ is the slogan on the box of the Backcountry Access Tracker DTS avalanche beacon. That's an apt description of the philosophy behind the Tracker. The dual-antenna BCA Tracker is designed to excel in single-beacon searches, offering a clear, intuitive interface for the fastest possible recovery. I like the Tracker's audible homing beacon, which helps guide you via both eyes and ears to a hidden beacon. And I especially like the real-time display, which prevents you from passing beyond a signal source before the display has updated correctly. Here's what I want in an avalanche beacon: I want to be able to pull the unit out of the box, switch it on, and quickly run a successful search. I don't want to have to study a complicated instruction manual. I don't want to have to practice constantly to keep reminding myself how it works. And I especially don't want to have to memorize tricky or unusual procedures. I want these things not because I am lazy, but because I assume in a real emergency, my brain will be functioning just slightly better than your average reptile's. If running a successful search with an avalanche beacon requires a high degree of practice and expertise, I reason, that's too high a burden for reliable, real-world scenarios. And a final word on this subject: even if you happen to be a wizard with your avalanche beacon—well practiced, know it inside and out—there's no guarantee that your buddy has a similar degree of familiarity with his beacon. And who's going to be looking for you if the worst happens? You can see why 'ease of use' is such a crucial consideration, and why the Backcountry Access Tracker is North America's best-selling avalanche transceiver. Don't get me wrong: I'm not advocating that you never practice beacon rescues. Far from it! I just want to be realistic. I just want what gives you and me the best chance to survive, and out of the box, the Tracker DTS is probably your best bet in the widest range of hands. 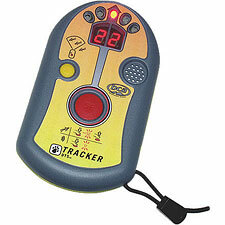 Given that, you may be surprised to learn that there is a bit of controversy surrounding the Tracker. Unlike its major competitors, the Tracker is not specifically engineered to handle multiple-beacon searches. Depending on who you talk to, this is either no big deal, or a deal breaker. Backcountry Access' position on this issue is clear: they believe the benefits of adding multiple-signal marking features are not worth the negative consequences in added complexity. Further, they note that statistically, multiple burial scenarios are rare. That is a controversy we're not going to solve here today. I will note that the Tracker DTS does automatically filter out multiple-signals during searches, directing you to the nearest viable signal. Once again, this makes the Tracker exceptionally fast in real-world searches. We can make a case that multiple-beacon marking capacity is important for some users (specifically, professional guides). For everyone else, the Tracker is a compelling choice.